Nicolai Kjaergaard stormed into the championship lead with a lights to flag victory at Snetterton Race one, with Kush Maini taking second and Linus Lundqvist third. Here's what the top-three said after the race. Second, Kush Maini: "It was getting harder and harder at Hamilton corner as the race went on, and it was getting tricky as the tyres overheated. Second place is a good haul of points and if we keep gathering points like this we will be challenging for the championship at the end of the year. "Towards the end it was getting really tricky and I almost went off a couple of times, so I'm happy with second place today." With the reverse grid format handing Maldonado pole after a late off track excursion in race one, the Venezuelan made the most of his pole to lead the field down to Riches on lap one, and held a lead of 1.8 seconds after the first lap, with Esmaeili holding second and Mahadik third, making a good start of his own from eighth on the grid. The real mover though was Kjaergaard, who looked on course to add to his impressive race two points haul so far this year, with another big gain on the first lap. His fellow race one podium finishers also enjoyed good first laps, with Lundqvist rising from 15th to 10th and Maini climbing to 11th from 16th. Maldonado's lead remained static at 1.8 seconds at the end of the second lap, while Mahadik continued his charge by passing Esmaeili for second. Kjaergaard made it 11 places gained with a move on Chaimongkol, however his charge was to end on the next lap with his second DNF of the year, with Tom Gamble also seemingly caught up in the drama as he too failed to complete lap three. At the front, Mahadik began to trim Maldonado's lead, with the gap being 1.5 seconds on lap three and 1.1 seconds on lap four. Meanwhile Maini's charge from the back was also brought to a temporary halt after picking up a puncture, forcing him into the pits. Mahadik was still closing the margin on Maldonado, with the lead down to 0.6 seconds on lap six, and 0.4 seconds on the penultimate lap. Maldonado though kept his cool to claim his second victory of the year, while Mahadik's second place is his first podium of 2018. Chaimongkol's podium came after a move on Arvin Esmaeili on the penultimate lap, with Lundqvist impressing as he regained the championship lead, gaining 11 points for positions gained in the race. The Swede was 10th from 15th by the end of lap one, and moved into ninth on lap two. He was fifth by lap five and finally claimed fourth after following Chaimongkol through on Esmaeili on lap nine. Esmaeili had held his own in the top-three for much of the race, but fifth is still his best result of the year. Owega's sixth was also his personal best, likewise with Pavan Ravishankar and Ben Hurst. Billy Monger gained two places on his starting position and moves up a place in the championship standings, with Charpentier also gaining two places on his way to 10th. Harry Webb started from the pit lane in an attempt to get clear space to set a fastest lap, and also pitted in the early stages for fresh tyres, but was unable to match his time from race one, which proved the quicker of the two contests so far, yet still claimed 11th in the race. Sun Yue Yang and Jamie Chadwick both pitted to change front wings, with Maini the last classified finisher after his puncture. Linus Lundqvist secured his third win of the season with a lights to flag victory from pole in the third race of the weekend at Snetterton, but had to fend off a race long challenge from Nicolai Kjaergaard who finished just 0.386s behind his title rival. 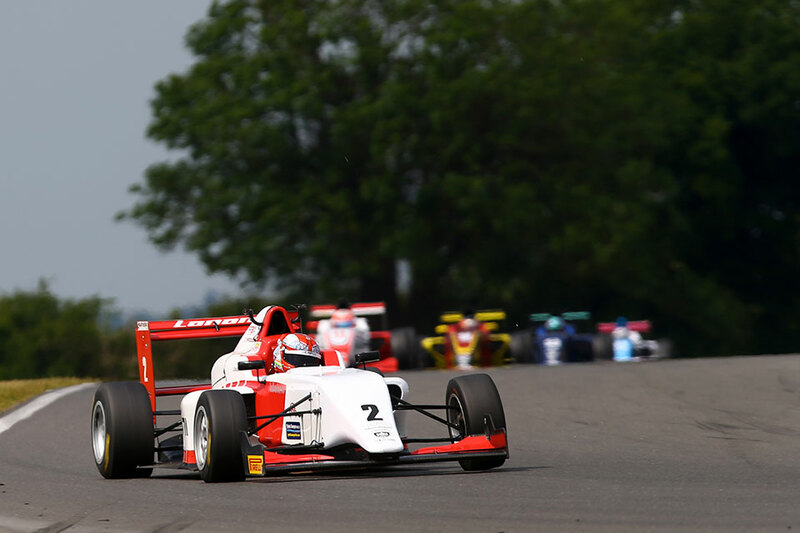 Kush Maini threatened to make it a three way battle for the lead for much of the race, but ultimately finished a second away from the lead duo, while Frenchman Tristan Charpentier held off a constant challenge from local man Harry Webb and Billy Monger. Jamie Chadwick claimed seventh, her best result of the weekend, just ahead of team mate Jordan Cane, with Hillspeed duo Sasakorn Chaimongkol and Jusuf Owega enjoying a decent battle to complete the top-10. Lundqvist made a good start from pole position, while Kjaergaard made a slightly better one and was almost alongside his championship rival on the run to Riches. The Dane attempted an early move at the Brundle/Nelson complex, but it was Lundqvist who led at the end of the first tour by just 0.166s, with Kjaergaard firmly in the slipstream and Maini not far behind. By lap three though it seemed as if Lundqvist was beginning to edge away, holding a lead of almost a second with Kjaergaard being hassled by Maini. But by lap five, Kjaergaard had all but eliminated it again with the gap back down to 0.261s, with Maini coming with him too and the lead trio separated by less than a second. Kjaergaard remained in Lundqvist's slipstream, but the Swede was able to stretch his margin fractionally to claim his third win of the season by 0.386s. Lundqvist's win means he has now won at every circuit visited so far this season, and stretches his championship lead to 30 points. Maini's third place was his fifth podium of the season, and was right with the lead duo until the penultimate lap when he fell a second behind, though he ultimately finished six tenths behind Kjaergaard. Charpentier's fourth place was his best result of the weekend, the event being his best of the year so far. He had to fend off a constant challenge from Webb, who completed an excellent debut weekend with another fifth place for Chris Dittmann Racing, and holding off a challenge from Carlin's Billy Monger who menaced him throughout the race, the trio separated by less than a second at the chequered flag.